They are willing to share and return to their innocence the ancient birthright and freedom the dolphins live in. They are also aware, as it is mystery school… the only guarantee is change. The dolphins are our teachers, and yet they too are evolving, and are here as we are in the third dimensional world with wants and needs. To be in their physical presence, in the presence of Dolphins that can travel far far from shore, it is truly a gift. No one can say to whom nor when it shall be given. Only that we go deeper within ourselves and get closer to Spirit in the asking with humbleness, and with love and gratitude for the magic in them and in each and every one of us. It is rare to see a person turn away from the news untouched when it's a story about a whale in distress. It's not just because of their size. An elephant in trouble does not seem to create the same caring and identification. 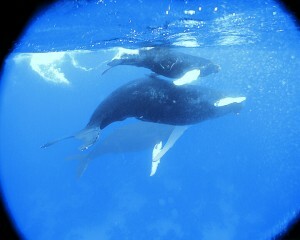 The whales seem able to model for us an open heart in a time where we so desperately need it, need to see it. It needs to be a big and visible demonstration. Maybe the dollar bill could say" In Whales we trust"
There are so few experiences that seem able to unify us and encourage us to bring out the traits that have gotten buried. Dolphins, but even more, the whales have been the able to elicit the caring that cuts across language, age and other barriers. Part of the wonderful mystery of the whales is the journey to get to them. Few areas in the world have accomplished what the Dominican Government has. 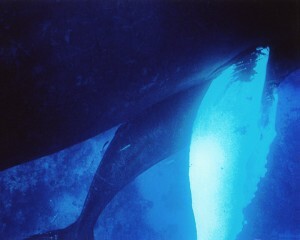 There is an area proclaimed a whale sanctuary, and monitored by the Dominican Republic in the Caribbean. Only a few boats are allowed a special permit to visit the Silver bank coral reef, four hours from Miami. I took a flight from Los Angles, stayed overnight in Miami, flew out the following morning with a four hour time difference in my sleep, reached the Dominican Republic two and a half hours later, and went by mini-van to the docks and boarded a large ocean going boat. The following morning we set out and reached our destination, and by afternoon, were in zodiac boats visiting with the whales. Time no longer mattered. It was daytime, or it was night time, with whales all day in-between, and thoughts and dreams about them at night. People from Maui, the big island of Hawaii, U.S. mainland,, Holland, Australia, New Zealand, England were all mixed together with one common denominator. Something that other people think crazy, bold or scary, was calling us together. 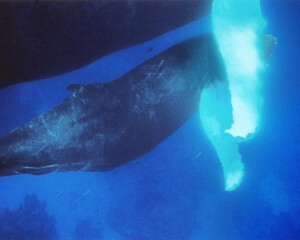 We not only love whales, but are willing to receive the gift of being with them, on their terms. In waters boasting 3-4,000 Humpback whales migrating from Nova Scotia, they were not always easy to connect with . In the zodiac boat, you could be sitting and bobbing in gentle or rough grey seas, in cerulean blue sky or where water and sky had merged into one shade of blue-grey . Sometimes the horizon disintegrated .In the distance you could imagine whale spouts, not sure if it was a blow or a wave kicking up off the very edge of the reef where coral from the ocean floor met the ocean's surface. Meanwhile, quietly on the other side of the boat, a zzzzzz sound or a huffing sound broke the spell of waiting. It was a whale surfacing, yards from the boat. A spray rose from the surface up to speed of 300 miles per hour, and a beautiful rainbow formed in the curtain of breath that hung in the air. Soon we were in the water, when invited, and hung suspended like corks with fins on. 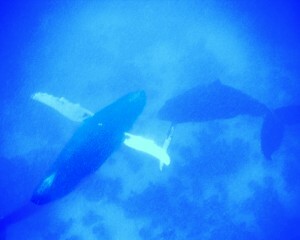 The whales were with new babies, and the eight to twelve ton babies were curious sometimes. They came to the surface to breathe, less capable in their direction, and spiraled up lazily, or surfaced awkwardly… but the mother was a majestic and humbling presence. We hung on the water, no one remembering to breathe, as 50 tons of consciousness rose carefully to the surface . Sometimes there was direct contact with an eye that seemed to hold all the records and secrets to the unconscious deep that was the ocean, that was also our souls. One day in particular, a female whale lay on her back, surrendered and vulnerable on her ocean bed, and to all of us visiting her watery home. For over twenty minutes, she lay belly and genital slit exposed, with pec fins, each the length of three people standing on each other's heads, waving languidly, gliding in grace and silence beneath us. It was the last day of our week with them, and it seemed a transmission was occurring that went directly in to my heart. "Be vulnerable, be open, trusting…" That image was to return the following morning upon awakening. I realized it in every cell in my being, I couldn't tell where it was within me, in my mind, or body. It had permeated me completely unlike any image I had ever seen. I realized it was no image, it was the whale and she was inside of me. Then and now. The photographs I was able to take, are not just photographs. They are holographic pictorial language given to me by the whales. I believe it is possible to receive from an image more than form and color, and even emotions. There is an encoding process happening from seeing ,dreaming, and especially swimming with whales and dolphins. Being around them allows the luxury of innocence and appreciation that children carry to resurface for us. We feel with our minds, see with our hearts, taste with our eyes . We… get the present. We get… the now. "It is rare to see a person turn away from the news untouched when it's a story about a whale in distress." Offerings from the whales to help create a home wellness environment. These images can be purchased as 8"x10" or 11"x14". Please contact Laurie@Dolphinata.com for more information.